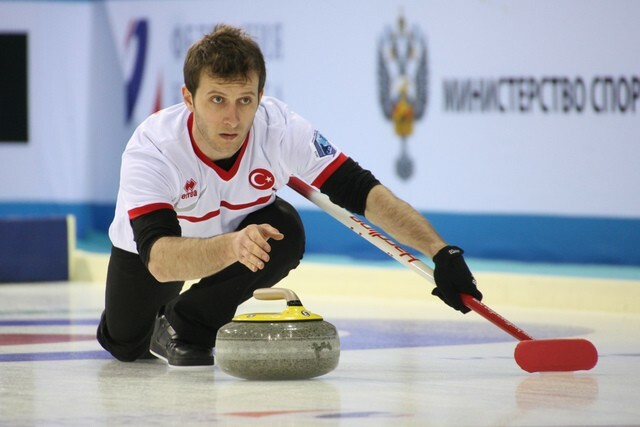 With all groups having played six sessions, Norway and Russia remain the only two teams yet to lose after four days of play at the World Mixed Doubles Curling Championship 2015 being held in the Ice Cube Curling Centre in Sochi, Russia. Group A were the first on the ice in the morning session of play, which saw hosts Russia edge Japan in a close encounter. This game went right down to the last end where Russia were able to take a single point to win the game 6-5 and keep their unbeaten record intact. The USA got back to winning ways after their loss to Russia yesterday. They only needed six ends to win 9-1 against France. Turkey meanwhile picked up their second win of the Championship as they stole two points in each of the last two ends to win 10-9 against Denmark. Australia sit at the bottom of the Group A standings still looking for their first win after they lost 7-3 to Slovakia while Switzerland won 10-4 against the Czech Republic. Group A returned to the ice in the evening where Russia extended their winning streak as they won their sixth game of the Championship, 8-3 against Slovakia. The USA made it two wins from two today as they managed to win 6-3 against the Czech Republic. Like the USA, Turkey also secured their second win of the day. Oznur Polat and Kadir Cakir stole the win once again, stealing one point in the last end to win 6-5 against defending champion nation Switzerland, represented this year by Marc Pfister and Carole Howald. After the game, Turkey's Kadir Cakir said: "It was really good, we just started really bad, but then we got some good luck. Today we have beaten Denmark, then Switzerland. If we continue like this, maybe we will go up. This is our second time that we've play Mixed Doubles, so we are really happy about this." Denmark and Japan got back to winning ways in this session, with Denmark beating France 8-3 and Japan defeating Australia 9-1 to leave both winning teams tied in joint third place. Group B also played two sessions today. In the morning Norway picked up the biggest win of the session, beating Latvia 13-3 to continue their flawless record. On the next sheet however, Sweden lost their first game, 8-2 to Scandinavian neighbours Finland. China defeated Austria 9-2 in this session while Italy’s score of four points in the seventh end in their game against New Zealand proved crucial. New Zealand could only take one point in the eighth end which subsequently gave Italy an 8-7 win. Brazil and Slovenia meanwhile played out the bottom of the table clash, with both teams looking for their first win. This game proved close, with the teams tied 6-6 going into the eighth and final end. However, Slovenia went on to score three points and win 9-6. Afterwards, Slovenia’s Jure Culic said: "It feels great to get our first win - we have been waiting for a few games for it. Congratulations to Brazil though, they really fought well. We know they wanted revenge after last year as we won that game too, but we played well." Slovenia couldn’t make it back to back wins when the teams returned to the ice for the late evening session. There they lost 12-1 to Norway’s Kristin Skaslien and Magnus Nedregotten, who retain top spot in the group having won all six of their games so far. Italy followed up their earlier win with a 6-3 win against Finland while Latvia won 10-4 against Brazil. China needed an extra end to defeat Sweden, 7-6, a result which meant five teams in Group B finished the day in joint second position – China, Finland, Italy, Latvia and Sweden. The only other game of the session saw Austria get their second win of the Championship as they beat New Zealand 9-7. Group C had a lighter schedule today with only one session of play. In their afternoon session, Canada lost their 100 percent winning record as they were beaten 9-5 by Scotland. Estonia and Hungary joined Canada and Korea in joint top spot as they both picked up wins, Estonia defeating fellow table toppers Korea 8-5 and Hungary winning 10-7 against Belarus. Spain remain on the tails of the table leaders as they picked up their fourth win of the week, 6-2 against Poland. Session 5: Russia 6, Japan 5; Denmark 9, Turkey 10; Australia 3, Slovakia 7; Czech Republic 4, Switzerland 10; USA 9, France 1. Session 6: Denmark 8, France 3; Japan 9, Australia 1; USA 6, Czech Republic 3; Slovakia 3, Russia 8; Switzerland 5, Turkey 6. Session 5: Brazil 6, Slovenia 9; New Zealand 7, Italy 8; Norway 13, Latvia 3; Sweden 2, Finland 8; China 9, Austria 2. Session 6: New Zealand 7, Austria 9; Slovenia 1, Norway 12; China 7, Sweden 6; Latvia 10, Brazil 4; Finland 3, Italy 6. Session 6: Korea 5, Estonia 8; Hungary 10, Belarus 7; Scotland 9, Canada 5; Romania 3, England 11; Poland 2, Spain 6.